Had anyone told me my page would win awards. I would have said "Mission Impossible"
This is not an award I won. It is one I EARNED! This one is special to me. Thanks Andy for EVERYTHING. Try for my Kool Kop Award it's easy. 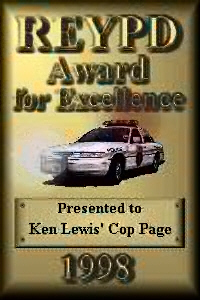 All Award Pages contain 10 or less images for easy loading. LEO AWARDS Page B. Christian Awards.